Open your hearts! Open your doors! 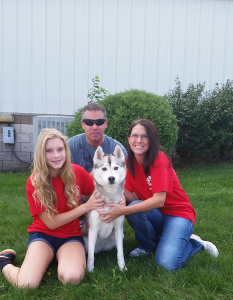 The Bakalar Family with their foster dog – Kandy. Foster families mean so much to the companion animals of Friendship APL. These homes are often the difference between life and death for hundreds of cats, kittens, dogs, puppies and other at risk pets. A foster home provides a temporary environment free from the illness and stress associated with life in an animal shelter. These homes allow our animals to heal, grow, and prepare for their forever family. 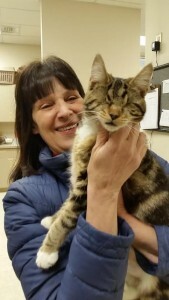 Ondine Duphil with her blind foster kitten. From bottle feeding kittens to hospice care for senior dogs, we are looking for a variety of homes. Newborn kittens and puppies can require much attention and may be best suited to those who are stay at home parents or work from home. Sick and injured animals often need alone time to recover from their maladies. These animals may go to any home appropriate to the disposition of the pet. Training or behavioral problem animals may require special homes where young kids are not present to allow us to better assess an animal. Mary Cordray is the head of our foster program. she is featured here with her foster puppy Izzy. We provide it all—food, litter, crates. We provide medication where applicable and access to vet care as needed. Our volunteers and staff are ready to answer additional questions that may arise during your foster experience. Orientation is the third Sunday of every month at 2:30pm.